The Airfix Mark I Tank was released in 1967 costing 2s 3d. It is to 1/76 scale, not 1/72 as claimed on the current box artwork. Neither is it, strictly speaking, a Mark I, but rather, a hybrid: a Mark II with tail wheels. Back in 1967, there was no Mark I at the Tank Museum, Bovington. The current vehicle displayed arrived from Hatfield Park in 1969, so Airfix appear to have based their model on the very similar Mark II that was on display. The end result is dimensionally accurate, but needs some minor modifications to make it a true Mark I. In particular, the cab needs widening, the angled roof hatch needs removing, and a circular hatch installed. When I decided to build a Mark I male, I thought it would be interesting to perform an even more complete job than just the above two corrections. I see lots of super-detailing work being performed in 1/35 scale, so why not 1/76? This is the account of that project, which took a considerable time, mainly working for short periods on odd evenings after work, and which also took quite a lot of research in and around the vehicles at Bovington. In places I have gone for appearance rather than strict accuracy, but I hope the end result is acceptably accurate. Let's first look at the roof detail. I removed the original oblong angled hatch assembly and blanked it off with plastic card. A new aperture for the circular hatch characteristic of the Mark I was drilled. You can see the before and after layouts in the picture. Note that a raised lip with rivet detail has been added between the rearmost two exhaust ports. The exhaust piping provided in the kit is not correct for a Mk I, so this will need replacing with roof-shaped "hats" over each exhaust port. Next, the driver's and the commander's visors need modifying. I opted for having them opening, with some loss in accuracy due to the minuteness of the hinges, but anyway, the Airfix visors are not strictly correct in that the covers for the slitted visors do not themselves have vision slits. The apertures behind the visors are plain oblong openings, with rounded corners. The driver's cab on the Mark I is wider than that on the Mark II, so I have cut off the original outer hinge brackets and added another set cut from a spare front plate. These show up as darker green in the picture. 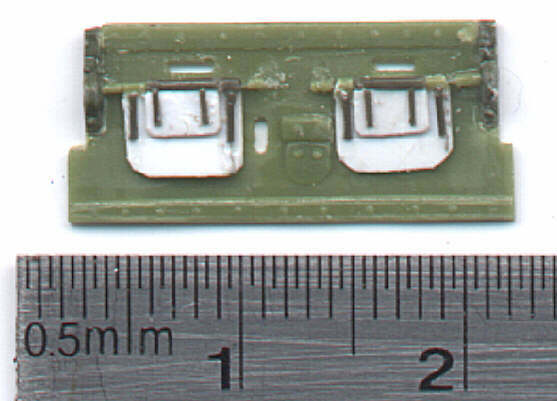 The method of making the hinges for the visors is given separately. As can be seen, I cut the visor plate from the glacis plate. This was for ease of handling - it is easier to work on a flat plate than two plates joined at an angle. This plate was also thinned down with a file, until the slits in the plate were exposed. You can see the white background showing through these in the picture. On the inside of these are replaceable vision blocks with their mountings. Other inside details for this plate include the mounting plate for the commander's machine gun, and the levers for adjusting the visors. A good idea of their appearance can be obtained from Look Inside Cross Sections: Tanks. Having made a wider cab front, it is then necessary to make a new cab to fit in place of the original Airfix part. I fabricated this from 10 thou plastic card. Embossed rivet detail was added on strips of plastic card. A word on embossing rivets is appropriate here: I found an old metal gear wheel from a friction motor. This had teeth at the right pitch for my rivets, so I mounted it in the handle of a discarded toothbrush to provide me with a suitable marking-out tool which could be run along the edge of a metal rule to provide a straight line of rivet marks. The shape of the gear teeth meant that these marks were not in themselves suitable as rivets, but they provided locations for final embossing using a blunt pin. This I prepared by filing the tip of a pin flat (a pointed tip will tend to perforate the plastic card) and then held it in a pin chuck so that only sufficient of the pin protruded from the chuck as to provide the required depth of embossing. Embossing was then performed rivet by rivet using the gear wheel marks as a locating guide. I used a plastic mat under the card to provide a surface to work on. A hard surface is unsuitable. Lines of rivets can then be cut from the embossed card using a ruler and scalpel. These embossed strips were used extensively to add interior rivet detail throughout the vehicle. This completes the essential exterior changes, although some extra detail can benefit the tail wheel assembly. I suggest a close examination of the vehicle at Bovington, if you can get a good look despite the full scale diorama it is now displayed in! There are also good pictures in Trevor Pidgeon's excellent book The Tanks at Flers , a book that I cannot recommend highly enough. Next, the engine assembly. 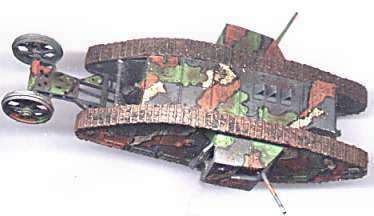 This dominates the interior of the vehicle, and is constructed on a sledge-like base. I made the engine with the covers in place, which makes life a little easier. The interior of the Mk II is almost identical to the Mk I. There are good pictures in The Tanks at Flers of the interior of the Bovington Mk II which I used in conjunction with my own pictures. Unfortunately, the perspex windows in place on the Bovington Mk II make effective photography difficult and the photos invariably end up spoilt by reflective flare. The interior of the Mk IV is easier to photograph and is very similar. 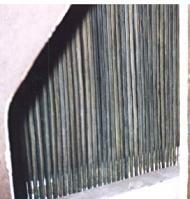 The tubes for the tubular radiator were made from stretched sprue. I had some difficulty finding out the correct pattern for this radiator, but finally managed to photograph it through a hole in the side of Bovington's Mk II. The tubes are evidently copper, and have gone a nice verdigris colour. The main differential housing was modelled out of filler built up on an appropriately sized wheel from the scrap box. Pipework for the cooling water circulation was made from brass rod, suitably bent. The lagged exhaust pipes were made from polystyrene tube. The driver's and commander's seats are very simple affairs, with thin padding for the seat and back. They are mounted on a perforated cross-beam, that in turn is placed on brackets on the front of the engine sledge. The cross beam is full width of the hull interior and also provides mounting points for the control levers. Again, The Tanks at Flers is a good source of information for this and for details of the various controls. Behind the driver is an hydraulic pump for lifting the rear wheels. This is driven from the main engine, and controlled by a lever which protrudes forwards and to the left of the driver. I could only find sketchy details for these items. Further information would be gratefully received. The driver's steering wheel is mounted on the interior of the glacis plate. I made the wheel from stretched sprue and the spokes from 10 thou sheet. To form the stretched sprue, I wrapped the sprue tightly round a slightly undersized metal rod, secured it with tape, and immersed it in boiling water. After cooling, a ring can be fashioned from a single turn of the resulting the sprue coil. The interior surfaces of the hull sides need apertures cut for the transmission cross-shaft, and the addition of ammunition stowage. I inserted pieces of perforated loudspeaker grill into apertures cut out of the inner hull sides for the shell stowage tube locations. The pitch of the holes was too large, however, but attempts to drill plastic card to a closer pitch were not successful, so I settled for general appearance, rather than strict accuracy. Probably, a better solution would be to use photo-etch techniques to etch the holes into a brass sheet, and in future I intend to set myself up to make such photo-etched parts from computer printed masks. 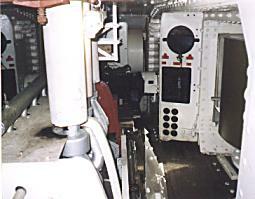 I did use drilled polystyrene sheet for the ammunition stowage in the sponson apertures and within the sponsons. I printed the marking out pattern by computer onto paper and pricked it through onto plastic card with a needle to provide punch marks for hand drilling the holes using a pin-chuck mounted drill. 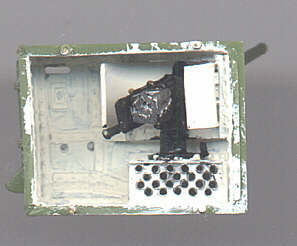 The shells were 57mm, so in 1/76 scale the holes need to be clearance fit for tubes of 0.75mm interior diameter, i.e. ~1mm. Each of the ammunition stowage tubes was made by rolling aluminium sheet obtained from a Chinese take-away dish (thicker than kitchen foil) around the shaft of a watchmakers screwdriver. These tubes may be tapered for ease of insertion by rolling them further on a tapered mandrel - I used the needle from a springbow compass. The same techniques were used for shell stowage in the sponsons. In cases where there is insufficient depth behind the perforations to permit tube insertion it is necessary to surface mount aluminium rings to represent the stowage tubes. I secured the tubes in place with office gum as neither superglue nor polystyrene liquid cement is suitable for bonding aluminium to polystyrene. In addition to these major items of detailing, the fuel tanks need to be positioned on either side of the driver and commander (see The Tanks at Flers), and brass fire extinguishers have to be provided. I made these from brass rod, which saves a painting problem. The interior of the rear door, including the latch, needs placing on the back-plate of the vehicle. Having completed the interior details for the hull, the engine assembly can be glued in place, together with duckboarding between the sponson apertures and the engine assembly. The 12V battery should be placed under the left of the differential assembly. Next, the sponsons. I first removed all mould marks and other unwanted blemishes from the inner surfaces. This included the gun mounting locations. I then drilled out the vision slits and drilled the internal pistol port locations to half the thickness of the plastic. The machine gun locations need mounting plates. Rivet detailing strips were added. 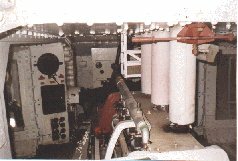 There is a picture of the interior of a Mk IV sponson in A New Excalibur (another fascinating read) which I used as a guide. Unfortunately, the sponson that was on display on a transport trolley at Bovington is no longer to be seen. I made new gun shields from sheet plastic, ensuring the provision of the slots for the gun sights. These shields were heat formed on a suitable rod in the same manner as the steering wheel sprue described previously. The sponson doors were thinned down, and the disposal chutes at the door bottoms were filed to give an opening. 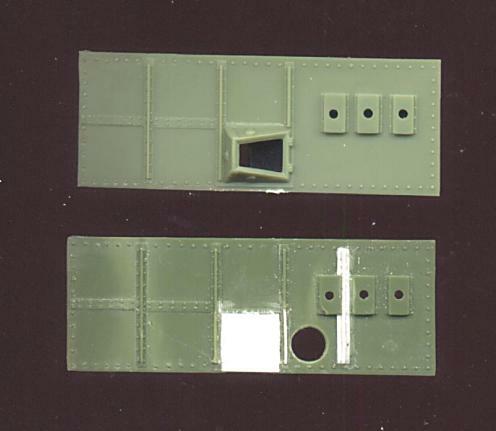 Pistol ports were partially drilled and door latches added. The Hotchkiss 6 pounder guns were fabricated from scratch, using a couple of heavily modified PaK 40 breech blocks from the bits box. Details of these guns can be found in Profile Publication's AFV 1914 '19 and A New Excalibur . 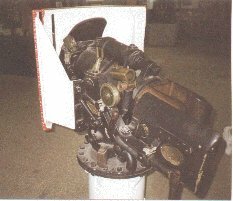 A short barrelled version as used in later marks of tank is on display at Bovington, see photo. The sponsons can be made to be removable by judicious use of brass pins for fixing them to the hull sides. For final finishing, I fitted Matador Models resin tracks in place of the vinyl tracks supplied with the kit. These have a pleasing irregularity and seem to me to be more like the originals. They have the advantage that single links may be used round the horns. For painting, the colour scheme for the Mk I is more interesting than for later vehicles, with black outlined areas of green, red-brown and cream camouflage. It is worth noting that only C Battalion vehicles had grenade nets on the roof, so a D-numbered vehicle may be preferable on grounds of robustness if the top plate is to be removable to view the interior. The Tanks at Flers provides a good source of vehicle histories for choosing a specific tank to model. I found that by careful positioning of the tracks it was possible to make the top plate clip positively into position which together with a removable cab structure gives adequate access to the interior. I have not covered every possible detail, but hope that this article, together with the bibliography may encourage others to try this or a similar project in 1/76 scale. Just because it is smaller does not mean you have to settle for less detail! AFV 1914 '19, Armoured Fighting Vehicles of World War One. Profile Publications, 1970. Now republished. A New Excalibur, The Development of the Tank 1909 - 1939, A.J. Smithers. Leo Cooper, 1986.